Create a lasting impression with beautiful custom swing tags made from your choice between the finest Italian nappa leather and a stunning faux leather material. Perfect for adding an original finishing touch to gifts, handmade items, or even your own fashion line, they ooze sophistication and style. Stand out and choose leather labels for your crafty projects. Custom leather swing tags are made and printed to order in a choice of four different sizes. For all of you fashion enthusiasts and craft lovers, these beautiful hand-finished printed swing tags will give your collections the perfect finishing touch. Made from beautiful Italian nappa leather in smooth or textured, or an impressive textured faux leather, choose to personalise your leather labels with a design, photos, text, or logo. All swing tags are printed on one side and hole punched in the top to accommodate a hanging string or chain. The other side is left unfinished, leaving the natural texture of the leather. Custom leather swing tags come in packs of 10, and you can choose from four different tag sizes. If you want to receive your swing tags ready to hang, then you have a choice of 150cm silver ball chains or red satin ribbon strings for each tag. 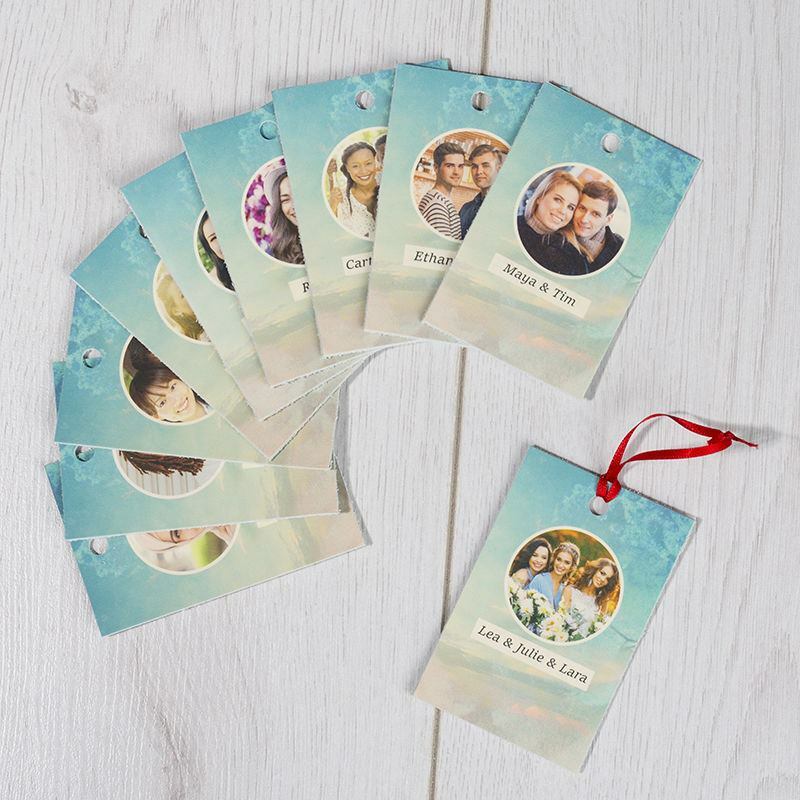 Our fabric swing tags are available in a pack of 10 with no minimum order, so you can stock up for future projects or just personalise a few special ones. Go one step further and stand out from the crowd and design your own swing tags. Click start design and upload your image. We source the finest Italian nappa leather or a vegan friendly faux leather, so each individual tag is totally unique, featuring different variations of the natural grain. We print your custom swing tag designs onto the sheet of leather and manually cut the amount you order. The print is permanent, and colours have a beautiful, finish. Because it's a natural product, the face will have the visible grain and pock marks. Over time, the real leather will develop a slightly creased patina, and all of this simply adds to the authentic charm. Perfect for craft and DIY lovers, these sweet personalised leather labels are ideal for gift wrapping. Once you've finished wrapping, simply attach to a bow for a final touch of love. If you make homemade wine as a hobby, attach a leather tag around the nape of the bottle featuring a little description about the care and love that went into each bottle. Fitted with a metal chain for easy attachment, create a design from the heart to show your friends and family just how much you care. You can use these as fashion swing tags, ideal for showcasing your clothing brand logo and garment details. Order a pack for each size XS, S, M, and L and put that professional touch that customers can't help but remember. Not just any old label you discard, these luxury swing tags can double as a business card for your fashion line, incentivising people to keep them for future reference.